Depending on how you look at it, things are either great, or they’re terrible. It’s certainly bad that Clayton Kershaw may be out until May, or even June. It’s bad that Brian Wilson‘s twice-zippered elbow is barking (even if he is going to pitch in the minors on Sunday). It’s bad that Yasiel Puig couldn’t be bothered to show up on time for the home opener, earning himself a spot on the bench today. It’s bad that articles like this exist. It’s bad that a huge amount of fans can’t watch these games — the text messages I received from a DirecTV-subscribing friend of mine who only realized this yesterday were illuminating — and worse that Time Warner and DirecTV are lobbing lies and accusations at one another. It’s bad that Vin Scully can’t watch the games he’s not in attendance for. It’s bad that Hanley Ramirez hasn’t hit anything. It’s bad that Adrian Gonzalez hasn’t hit anything. It’s bad that Andre Ethier hasn’t hit anything. These things are bad. Bad things are bad. And yet! Despite all that, the Dodgers have won four of their first five games. While the Giants are 3-1, the Padres, Diamondbacks, and Rockies are a combined 3-10. 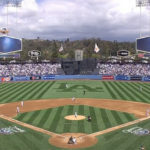 After endless games in Arizona and Australia and San Diego, wrapped around fake games in Los Angeles and Anaheim, the Dodgers are back home for a game that counts for the first time since beating St. Louis 6-4 in Game 5 of the NLCS, way back on October 16, and Dodger Stadium is gleaming with yet another round of new improvements. Oh, and Matt Kemp is back too, playing center and hitting second, after initially not being in the lineup before Puig happened. 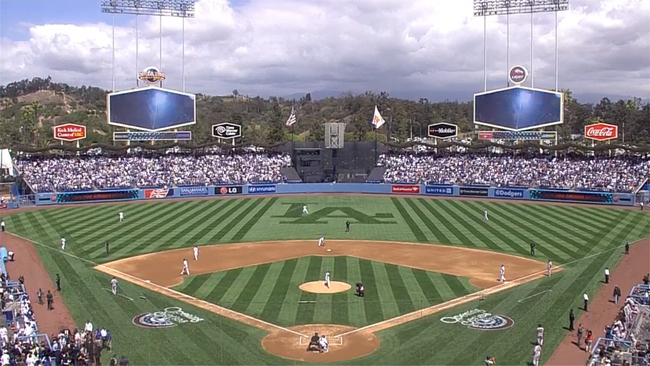 There’s baseball, real baseball, day baseball, with Kemp and Hyun-jin Ryu at Dodger Stadium. You know what? Maybe things aren’t quite so bad after all. As expected, Mike Baxter was optioned back to Triple-A Albuquerque after going 0-7 with a walk in eight plate appearances, including one start. And as Kemp works his way back onto the roster, we’re reminded that what so many people think is a problem is not yet a problem. There has still never been a game where Ethier, Kemp, Puig, and Carl Crawford have all been healthy and active for a full nine innings. Last year, there were only two games where it even started that way, and Kemp was injured by the end of each. Does it count if that ends today because Puig either sits out or maybe only pinch hits? I guess we’ll see. Puig is still listed among the reserves, and we don’t know if he’s out for the day or just not starting. Either way, good luck bringing in lefty Javier Lopez to face Crawford or Ethier in the 8th inning, Bruce Bochy. This bench just got mildly less terrible. Also, this! Chad Billingsley will make his first rehab start on Sunday for Single-A Rancho Cucamonga. He is expected to need five rehab starts — three in Rancho around two in Albuquerque –, which means he could only be about a month away from returning. If all goes well, it seems more likely than not he could actually beat Kershaw back to the mound.